This is my most recent quilt. I made it for my skateboard-loving daughter for Christmas. 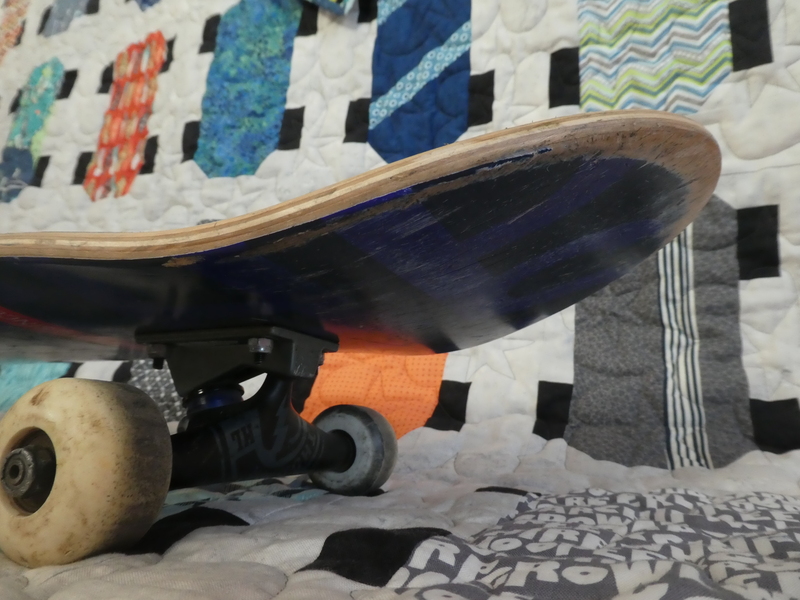 It is the Skateboard Quilt pattern from the Missouri Star Quilt COmpany. I put two layers of batting in it to make it warmer to put on a bed. 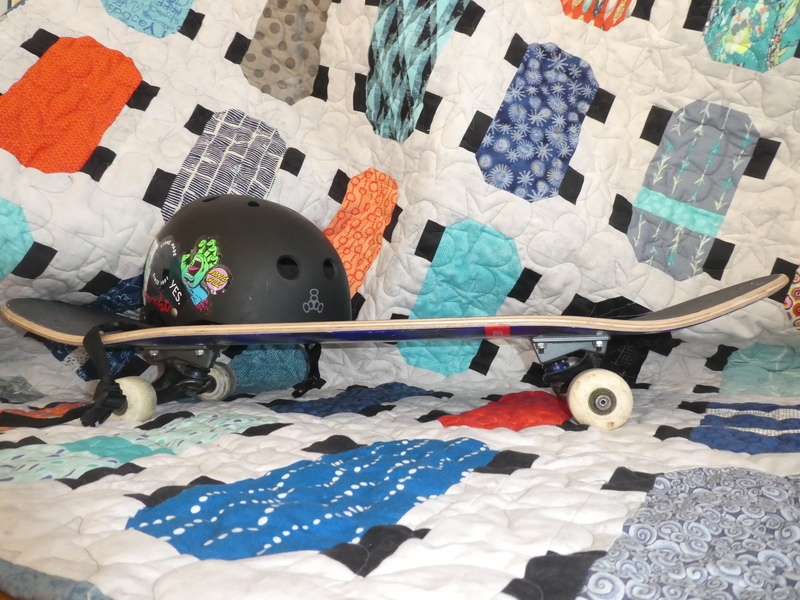 I quilted it with a star pantograph on the longarm because I always call my daughter “my little star”. She loves to cuddle up in it while watching TV! My Grandmother turned 101 years old in the beginning of February. I wanted to make a little something to celebrate her birthday . 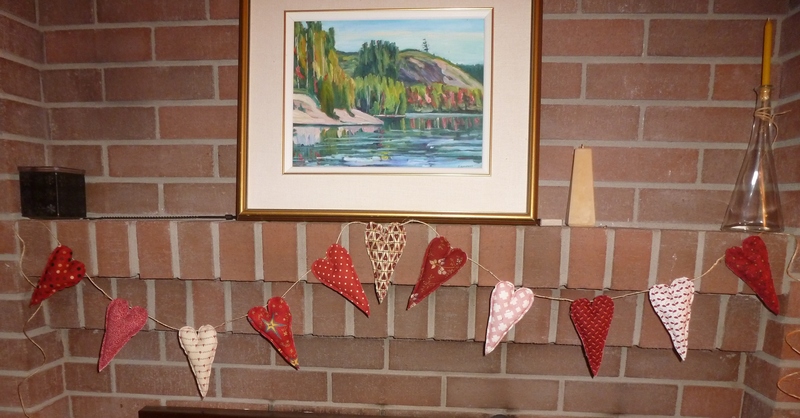 I sewed some hearts and stringed them with a sisal cord. I wanted to see what it would like hanging on a wall or in my case, the fireplace. I loved my hearts! For a moment, I thought I would keep it. But it looked even better at my Grandma’s. PS Can you image how many quilts we could make if we all lived to 101!! Je vais assister à la fête d’anniversaire d’une bonne amie demain – elle aura 40 ans! Alors j’ai décidé de lui faire un sac, mais d’essayer un nouveau patron cette fois, pour faire changement. La belle-soeur de ma soeur m’a prêté le patron Sonoma Swing Bag de Pink Sand Beach Designs car elle l’avait essayé et l’avait aimé. Alors je l’ai fait, avec des tissus plutôt modernes, et une gamme de couleurs que je savais que mon amie aimerait. J’ai mis du Soft and Stable (de byannie.com) entre les épaisseurs de tissus pour lui donner de la raideur et de la stabilité. Même si j’ai eu quelques petits obstacles, je suis contente du résultat final. J’espère que mon amie le sera aussi! A little robin was added in the centre square at the top of this quilt! This block is to be added to the shirt block – the hearts are made from ties. This quilt is especially meaningful to the Quiltuplets since it’s made from old shirts from my grandfather, who died in 2011 (mentioned in Michèle’s post from 2014). I love how everyone added their own personality to the starting blocks. What will the next additions look like? It’s been quite a few months since the last post (almost 8!). We’ve all been pretty busy with quilty and non-quilty things, but I have a few posts ready for the next few days. Today’s post is long overdue since it’s about a project we started in late 2015: a round robin. 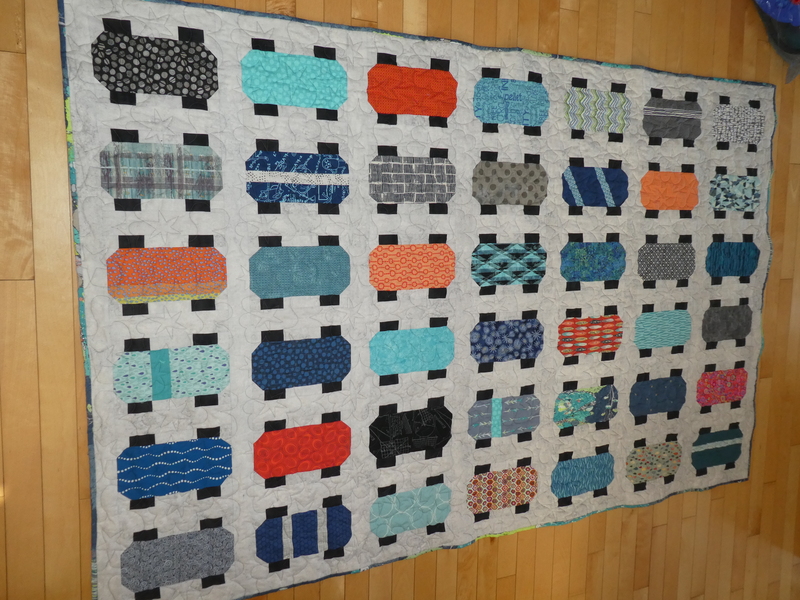 Each of the six quiltuplets prepared a block as the start of a new quilt which was passed on to the next person in the group. 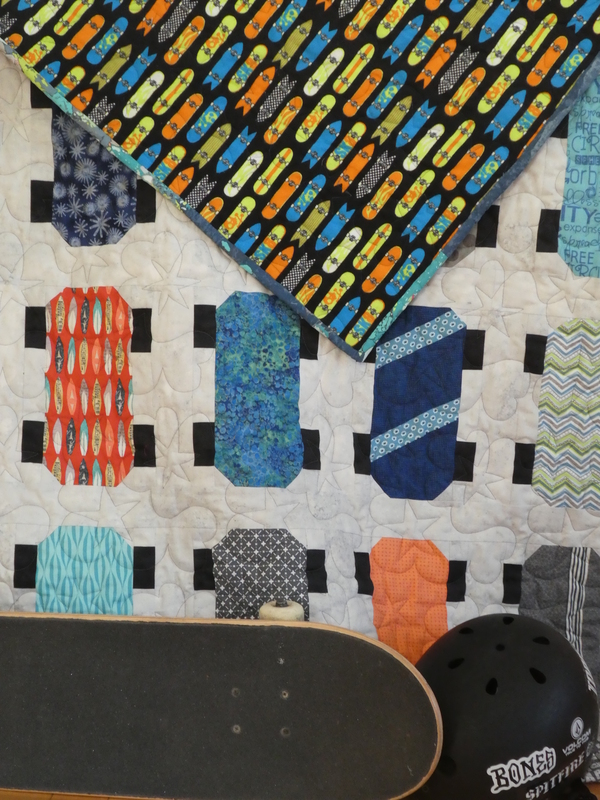 At each stage, we all add a bit to the quilt we’ve received with fabrics from the original block and pull some more from our own stashes (if needed). Everyone has a different style, so I can’t wait to see the end results! Check back later to see what happens after the first swap!